Healthy marriages do not simply happen, though our culture’s marriage landscape suggests otherwise. Married couples need a strong foundation that the majority of people cannot build on their own. 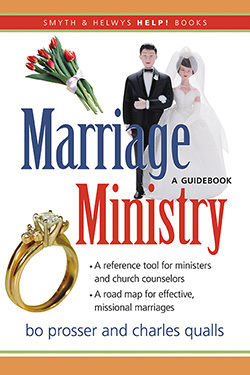 How can ministers best prepare engaged couples for the altar? And how can ministers help provide the needed material for healthy growth among married couples in their cultures? Bo Prosser is the Coordinator for Congregational Life with the Cooperative Baptist Fellowship in Atlanta, Georgia and has served many years in the local church. He is the co-author of Lessons from the Cloth and Building Blocks for Sunday School Growth. Charles Qualls is the Associate Pastor for Pastoral Care at Second-Ponce de Leon Baptist Church in Atlanta, Georgia. He is the co-author of Lessons from the Cloth andBuilding Blocks for Sunday School Growth.